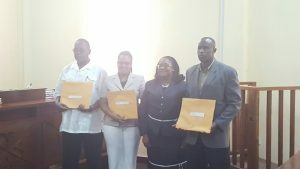 Chief Magistrate, Ann Mc Lennan (centre) flanked by (left to right) Retired Assistant Commissioner of Police, Winston Cosbert; Christine Bailey and Retired Brigadier, Bruce Lovell. One month after the Head of the Customs Anti-Narcotics Unit (CANU), James Singh was sent on leave, a Commission of Inquiry was Friday sworn in to probe the role that agency and the Guyana Defence Force Coast Guard played in the detention and release of a vessel. “…whether the Customs Anti-Narcotics Unit had the authority to order the release of the vessel and whether such an order was lawful and/or justifiable in the circumstances,” the terms of reference for the Commission of Inquiry states. The private vessel was in Guyana between February 11 and 14, 2017. Two days later, on February 16, 2017 another vessel with four Guyanese aboard were intercepted by United States and Trinidad authorities in international waters with 4.2 tons of cocaine-the biggest haul in 20 years. Singh has been asked to remain on leave. He is expected to be among those to be summoned by the Commission of Inquiry. Sources have told Demerara Waves Online News that that vessel had been suspected of carrying cocaine in Guyanese waters, but when it was escorted inland and searched nothing was found and it was released. The Commission of Inquiry will seek to ascertain under what authority the Customs Anti Narcotics Unit and the Guyana Defence Force carried out such an exercise. The probe will seek to determine if anyone violated Guyana’s laws and recommend disciplinary action against anyone deemed culpable. Under the chairmanship of retired Brigadier Bruce Lovell, the three-member Commission will seek to determine the circumstancrs under which CANU received information, including the exact date and time of the receipt of such informatikn, that an unnamed private maritime vessel , entered into, was detained and searched in the sea space of Guyana between 11 and 14th February, 2017. The other commissioners are Retired Assistant Commissioner of Police, Winston Cosbert and Ministry of the Presidency official, Christine Bailey. Lovell had previously probed allegations against CANU by now convicted drug trafficker, Barry Dataram. They have until April 12, 2017 to submit their report to President David Granger. The Commission of Inquiry has been also tasked with asceratining whether the operation to intercept, detain and search the vessel was approved by any superior authority in Guyana. Also to be determined are whether there was timely passage of information to President David Granger, Minister of Public Security, Khemraj Ramjattan or Minister of State Joseph Harmon and whether such passage of information was adequate. The ownership, capacity, capabilities, the identities of all persons who were on board, and whether any narcotics or prohibited substance was aboard the vessel before it was intercepted and whether any was removed before it was intercepted are among other areas to be probed by the Commission. The Commission will have to determine who should be blamed and recommend changes that should be made in relation to the reporting, investigation and prosecution of offences committed at sea and what measures, if any, are required to prevenr the recurrence of similar incidents in the future. The Commission has also been asked to recommend changes to the organisation, staffing and management of CANU.